By Daniel H Wilson - a Review! I am about to do the unthinkable, I am going to blog about Science Fiction on what I suspect is classified as a mummy blog. Now, correct me if I'm wrong, but I think that is the equivalent of blogicide. Ah well, you can always tut and skip this one if you like. Please can I just stress, the Brink of Bedlam is not a 'Book Blog', I know I've done a few book reviews recently and if books aren't your thing, you're maybe looking at your watch and yawning right now. I've just that I've been sent a few by kind publishers, and in return I said I'd review them - which I'm more than happy to do. I'll be back on with random parenting topics soon enough if that's more your kind of thing. Promise. Hang on in there. It is actually an absolute pleasure to read a bit of half-decent science fiction. 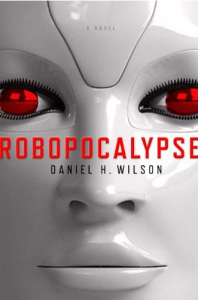 Simon & Schuster sent me 'Robopocalypse' by Daniel H Wilson and I was immediately curious. I tend to read this genre of book only when I recognise the author, so this was unknown territory for me. Unlucky for me, but lucky for Simon & Schuster I was hospitalised for a couple of days last week and spent hours of undisturbed time stuck in a very quiet room on my own, so I ploughed through this in two days. It was no hardship either, I quite enjoyed the writing style, the characters (the ones I could keep track of anyway) and the majority of the slightly stilted plot. I have to confess, although I do love science fiction, I get very fed up with 'scary aliens' and 'gone mad robots', generally I do prefer a story with a bit of scientific meat to it, something half believable at least. With this in mind although intrigued by this book, I braced myself for a familiar story - namely robots take over the earth, people are not very happy about having to fight off aggressive toasters, blood loss, battery fluid leakage, end of story. In many ways I wasn't far wrong. With a book title such as 'Robopocalypse' how could I really expect anything else? Throughout this book, I felt I was reading a screenplay rather than an actual solid steel novel. As far as I'm aware 'Robopocalypse' has already been earmarked for film production by Stephen Spielberg and I can well believe it! It has all the right ingredients for a typical blockbuster. Without giving too much away, each chapter is dedicated to 'Heros' who fight nobly against the evil robot hoardes - if that's not a 'feel good' film in the making I don't know what is. Call me bias, but I often find films such as these lack depth and this book shows similar traits - which is probably why it would make such a great mainstream film. One that I wouldn't go to see though, sorry! 2001 it 'aint! The author does a reasonable job of conveying the voices of the different characters and you are drawn to care about them a little, and the mini stories that are covered in each chapter are interesting in their way. What drove me mad was that the characters were picked up and dropped in random places and the story jumped about quite a bit. There were also huge holes in the narrative which were very frustrating. How five completely outnumbered, virtually unarmed squaddies escape masses of rampaging robots and robotic zombies and live to see the light of day is not explained in one chapter. They simply appear alive and kicking in the next one. I honestly felt as if someone had ripped a couple of pages out of the book. There were other instances I shan't bore you with. 'Robopocalypse' also appears to be very male orientated, if not downright 'macho.' The men seem to do the fighting stuff, and the women appear as wives, robotic wives (I'm not joking) and mother hen types. There is one woman who fights alongside the men, but I simply cannot forgive Daniel H Wilson for saying that in the midst of a long and bloody battle she 'peeks' out from behind a tree. If a man at that point had done any 'peeking' whilst dodging bullets I'd have died laughing. It just seemed a little sexist. This female character predictably falls in love with one of the other lead characters too, which made me feel a little nauseous too. Just for once it would have been refreshing if they'd hated each other's guts, but then that wouldn't make for a good film kiss would it? The thing is, I did enjoy the book, there's no denying that. It is a chick-flick style, science fiction epic, except with more emphasis on the chick-flick and less on the epic. 'Robopocalypse' as a whole is a good read, it just seems to miss a strong narrative link and depth . I suspect the author simply lacks experience and concentration, or maybe just wrote it whilst drinking excessive amounts of coffee. I recommend you do likewise, drink shed loads of 'proper coffee' and cane the book. It's a quick, enjoyable read, best read with a bit of adrenaline and not much thought.